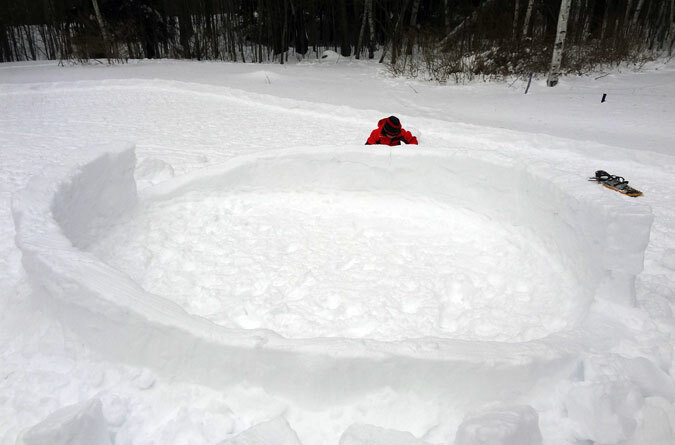 How to Make an Igloo — and Camp Out Too! 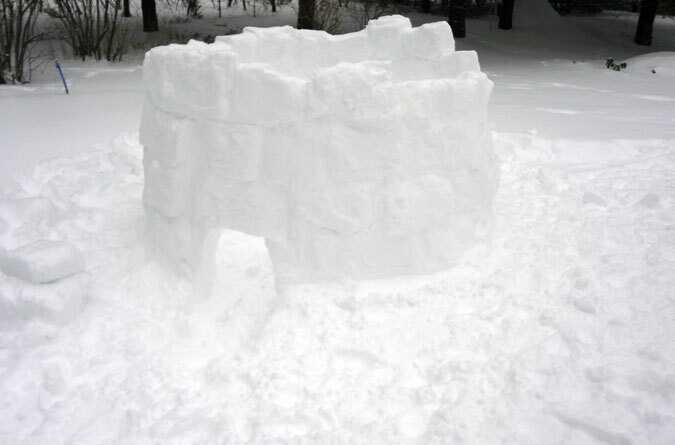 How to Make an Igloo — and Camp Out Too! 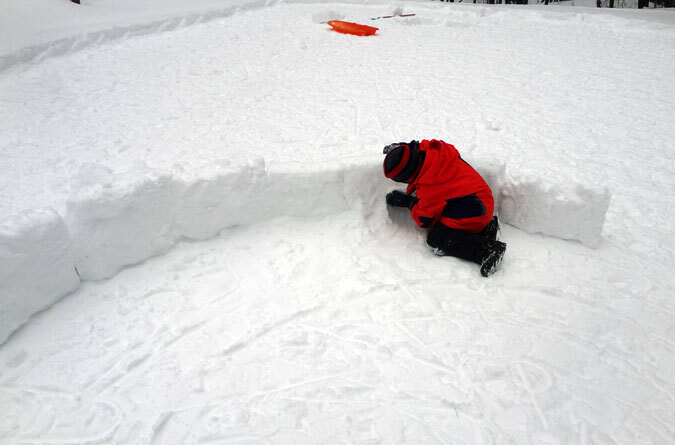 How to Make an Igloo — and Camp Out Too! I’ve always wanted to make an igloo and camp out. Inspired by an article in my son’s Boy’s Life magazine, I figured it was time to check-off this winter bucket list item. So for this adventure my eldest son and I traveled to the deepest, darkest, New Hampshire forest—okay, alright, it was our backyard. Cut me some slack, my eldest son is six, so we needed a bailout plan. 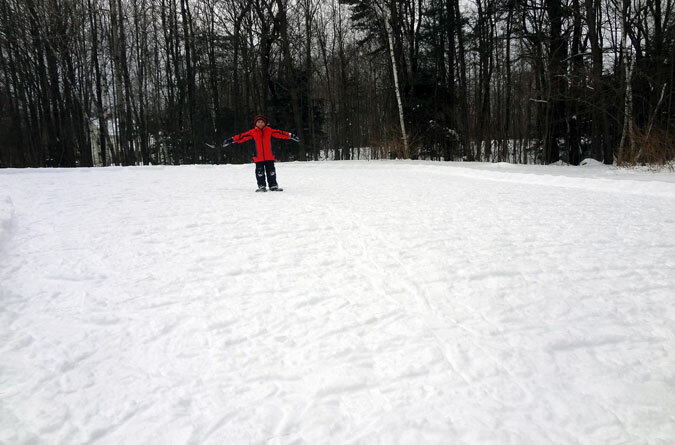 Pack down a large area of snow using snowshoes (or cheat with a snowmobile). You’ll want to go over each spot at least three times to get the snowpack good and hard. Our base was about eight inches thick once packed. 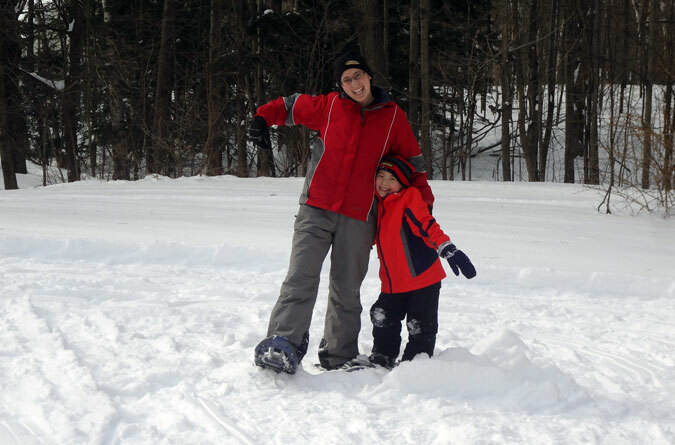 The snow packing was a full-family affair. So why did it take us three weeks to complete the igloo? Slackers falling asleep on the job didn’t help. We ended up packing three times as much snow as we needed. This whole thing was a learning experience. The blocks we cut were a little bit taller than a foot, and about two feet long, which for the most part was a good size. Since we were in our backyard, I had the benefit of using an ice scraper to measure and cut the blocks, and then the shovel was used to pry them free. 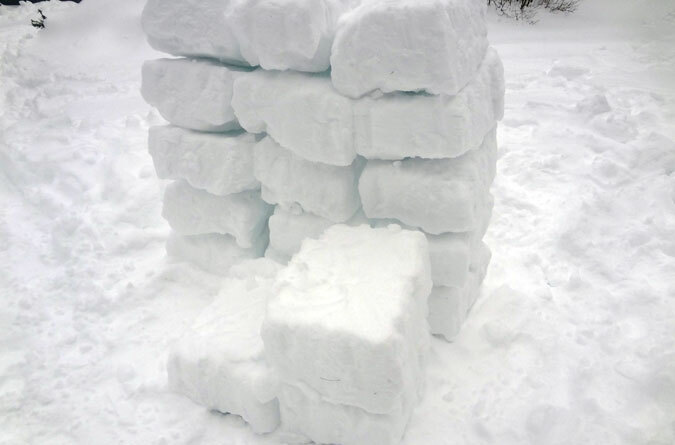 A stack of pre-cut igloo blocks awaiting construction. Having only one adult made this part of the process long and tedious. To break it up I cut enough blocks for one row of the igloo, placed them, then went back to cutting. Ideally, if you have two to three full-sized people, you could significantly speed things up by turning the blocks-to-build process into an assembly line. Line the blocks up on their side in a circle to build the base. The circle should be just big enough for you to lay down in the middle, which, if done properly, should culminate in an igloo that’s about five feet tall. It’s worth admitting that the circumference of my first attempt was way too big; it wasn’t until I got the walls to shoulder height that I realized the thing would be twenty feet tall before enclosure. Needless to say, day one ended long after my son retreated to the warmth of the house, myself ensconced in the pity of self-defeat. The second attempt at the base still ended up being a little big, but it was at least manageable. We put down two rows of blocks, one on top of the other, filled in all cracks, and gave it time to harden, before properly cutting the base. My crack filler hard at work. Not depicted: endless complaining and negotiations. To cut the base, you want to visually halve it and cut down on a gradual slope from the top of one half to its bottom. Do the same with the second half, starting the top where the bottom of the first half ended. This is a crucial step in the structural integrity of the igloo. Once the two halves are set, cut the top of the base in at a slight angle so that the next row starts to lean toward the center. The igloo base after being cut. Note: this was the way-too-big version of the base. Don’t build it this big unless you’re looking to house an entire hockey team. And have a crane to finish the top. Start each row at the low point of the spiral and trim the blocks so they fit snugly one into the other. This can be tricky, and gaps aren’t the end of the world as you can fill them in afterward. It’s remarkable how the blocks hold as they’re slid into place. After each row is laid, cut the downward angle along the top for the next row. The small saw I used to trim the blocks. As previously noted, it also served as Leonardo’s sword. 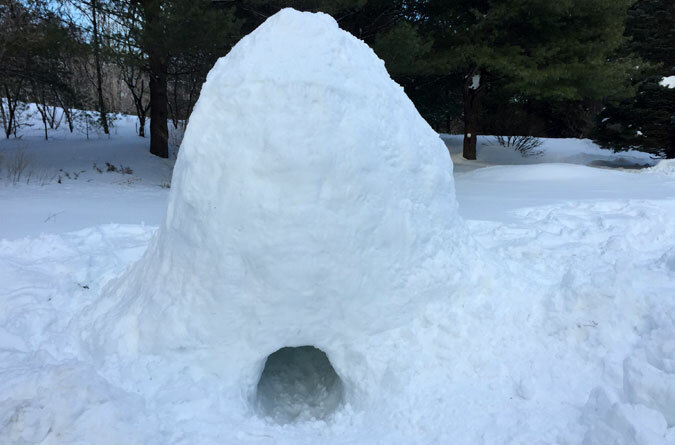 No children were injured in the construction of this igloo. 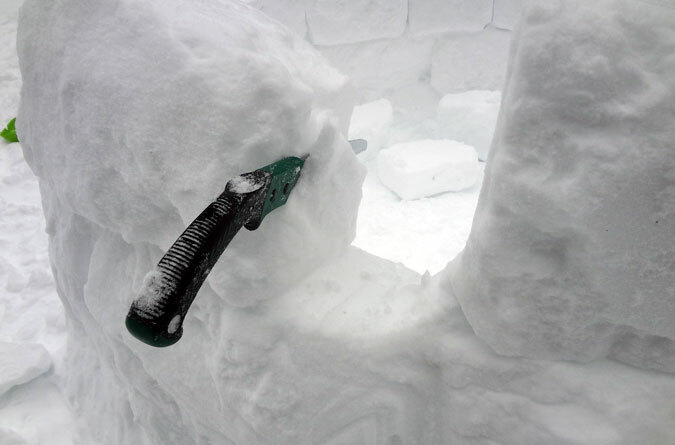 It’s best to lay the blocks from inside the igloo to keep them from falling inward as placed. This part of the process is also where it would have been tremendously helpful to have a second adult involved. The issue is that the previous row built can be a little unstable if another row is immediately built on top, resulting in tumbling. Since I didn’t have another adult to help hold blocks in place, the solution I devised was to build a row, pack it in with snow, and then leave it to set. The setting should only take an hour or so, but for me, that really meant the next day/week…thus this turned into a three-week project. Once the wall is too tall to step over, you’ll need to cut an entrance. Instructions on how to do this “correctly” are below. Slowly but surely the walls were built. It wasn’t without a few accidents, which may or may not have resulted in words unfit for a child’s ears. This shot shows a completed row before the top was trimmed. Keep angling each row in as before and eventually the pieces will meet in the middle. Because my base was too wide, I ended up needing a small step ladder to complete the roof. A shot of the roof coming together from the inside. 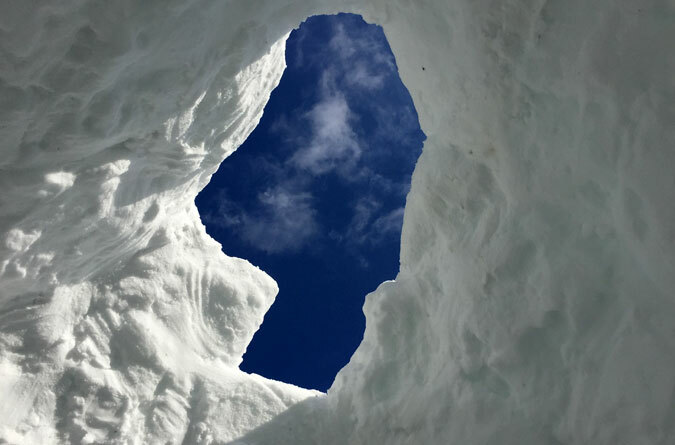 The last few pieces of the roof will likely need to be cut to fit the available space, and you’ll want to pack snow into the cracks for stability and peace of mind. Once the roof has had time to harden, cut a small air hole into it. The completed igloo. It wasn’t perfectly symmetrical, but not bad for our first time. A proper entrance should have a trench that starts well outside of the igloo and burrows under the wall, coming up from the floor on the inside. 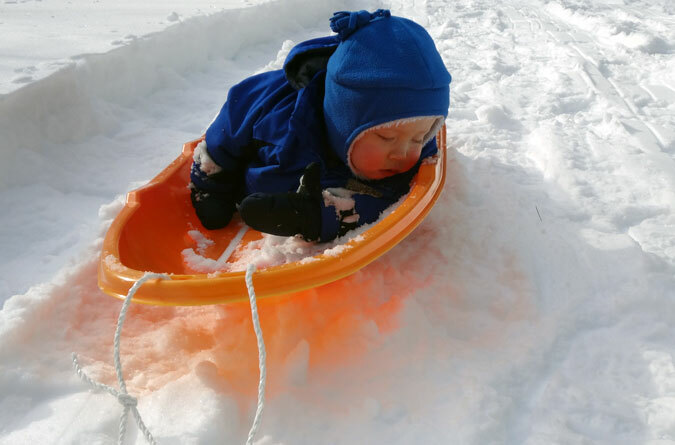 The ability to do this “correctly” depends somewhat on the snowpack beneath the igloo. The trench should also be enclosed with snow blocks. While our opening did go down and then up, we didn’t bother building a longer, enclosed trench. This was a mistake, as it caused the igloo to get colder inside. If you’re fortunate to camp out on the same day as the igloo was constructed, you’ll want to change any wet or sweaty clothes, because these will pull heat from your body. While you’ll want to have a sub-freezing sleeping bag, it’s important to know that the temperature ratings on those are assuming you’ll be wearing clothes. So wear clothes, and dress in layers. The base layer should be something that pulls moisture away from your body such as EMS’ Techwick series. If you get cold easily, you might want to consider two long-john layers on your legs. I’d finish the legs off with fleece sweatpants or a nice softshell pant such as these fleece-lined pants from Mountain Hardwear. If you start getting hot, shed a layer before sweating. On top you’ll want a mid-weight layer of fleece or merino wool, with the best option for a third layer being a down jacket, because it also makes a nice pillow if you’re too hot to wear it. Lastly, wear a good winter hat and mittens, and pack hand and toe warmers. For our sleeping area we laid down a survival blanket to reflect heat back to us. 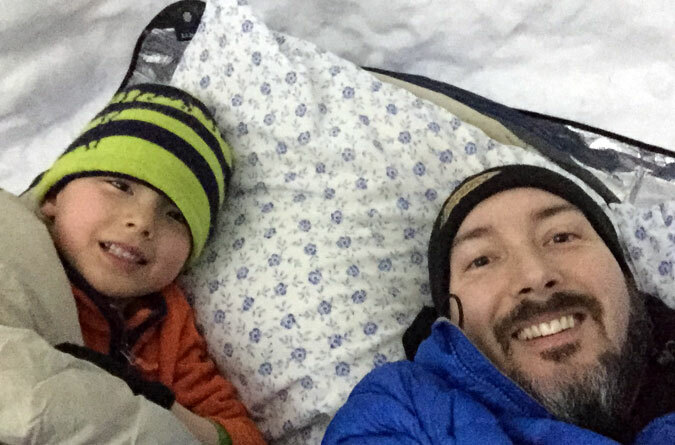 My son got the inflatable Therm-A-Rest sleeping pad and I used a Therm-A-Rest solar sleeping pad. Keep in mind that it’s not a good idea to use the inflatable pad directly on the snow as the air inside will get cold and transfer that uncomfortableness to you. It’s not a bad idea to use both, the solar pad on the bottom with the inflatable pad above it. Unfortunately, I only had one sleeping bag rated for below freezing, so my son got that and I made do with a 32-degree bag. It was 15 degrees out when we went to the igloo with an overnight low of one degree, I’d built the igloo too tall, and the entrance wasn’t properly enclosed…so, well, you can probably do the math. All tucked in and ready for a good night sleep. So, how’d we fare? My son made it to 12:30 before asking to go in. He insisted that he wasn’t cold and just missed being inside (good thing we were in our backyard). I was getting a bit chilly and had thrown a spare sleeping bag over us prior to his asking to go inside. After tucking him into his bed in the house, I returned to the igloo and finished the night fine in the good sleeping bag. The next morning my son told me he wanted to do it again. It might be time to fix the entrance.